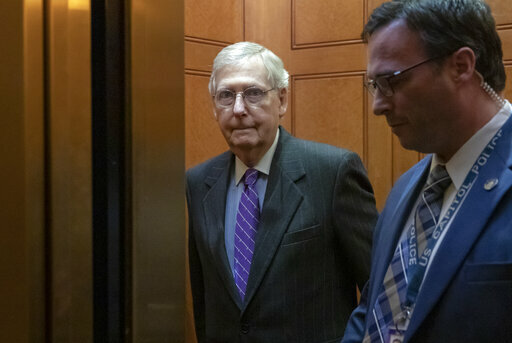 By Miriam Valverde on Wednesday, January 23rd, 2019 at 4:54 p.m.
A proposal from Senate Republicans to end the partial government shutdown includes not only the $5.7 billion President Donald Trump seeks for a border barrier with Mexico, but also landmark changes to the U.S. asylum system. It’s uncertain if the proposal — in its current form — would pass the Senate or get approval from the U.S. House of Representatives. Democratic leaders in Congress have already come out against the proposal. The changes are enumerated in an appropriations package released by Senate Appropriations Committee Chairman Richard Shelby, R-Ala. PolitiFact examined the overall provisions in the Republican proposal and in a Democratic measure, both scheduled for a Senate vote Jan. 24. Here’s what the proposal entails and how it would impact future asylum seekers. What are the major changes Republicans propose for the asylum system? Under current law, immigrants cannot apply for asylum outside the United States. They must apply for the protection once they are in the United States and can do so whether they arrived here legally or illegally. The proposal says that children under 18 years old from El Salvador, Guatemala, and Honduras who want to apply for asylum will have to apply outside of the United States at designated application processing centers in Central America. Children seeking asylum must also meet other criteria, including having a qualified parent or guardian in the United States who can take them into their custody. They can’t have an outstanding deportation order nor have been previously deported or denied asylum. They also can’t be a public safety or national security risk. The bill also says that a child can be referred for asylum by the United Nations High Commissioner for Refugees or a nongovernmental organization designated by the Secretary of Homeland Security. Does the proposal set quotas on asylum applications? Yes. No more than 50,000 application referrals per fiscal year, and no more than 15,000 asylum grants per fiscal year. Currently, there are no quotas on asylum applications or approvals per year. Where would the designated application processing centers be located? At least one center would be established in each of the following countries: Belize, Costa Rica, El Salvador, Guatemala, Honduras, Mexico, Nicaragua, and Panama. They would be established within 240 days of the proposal’s enactment. If the Department of Homeland Security does not approve an asylum application, can it be reviewed by an immigration judge? No. The proposal said no court or immigration judge shall have jurisdiction to review a DHS determination. Under current procedures, immigrants apprehended at the border and found to have credible fear of torture or persecution in their home countries present their case in a defensive asylum process before an immigration judge. Is this proposal likely to decrease the flow of migrants at the border, particularly unaccompanied minors and family units? No, said most experts who responded to a PolitiFact query. If the proposal became law, it would have little deterrence effect and there would likely be a court challenge, increasing confusion over it, said Louis DeSipio, a political science professor at the University of California-Irvine who studies immigration. "More importantly, many of the migrants are fleeing dire and dangerous circumstances," DeSipio said. "They are not able to wait in their countries of origin while their applications are being reviewed." On the other hand, the proposal could deter immigration because it would provide a process by which individuals apply for asylum without having to undertake the journey to the United States, said Andrew "Art" Arthur, a resident fellow in Law and Policy for the Center for Immigration Studies, a think tank favoring low immigration. Would the proposal help reduce the immigration courts backlog? There are around 800,000 cases pending in immigration courts (not all are asylum cases). That backlog is so extensive that it would take a long time to see the effects of the proposal, if it became law, DeSipio said. "Over time, this proposal could reduce some of the backlog; if the review in the countries of origin and referrals are legitimate, some migrants will be able to be processed in this way," DeSipio said. Arthur also said the proposal would diminish the backlog in the long run because it would decrease the number of new cases. It would also deter fraudulent asylum claims, he said. Would the proposal conflict with international law that allows migrants to apply for asylum at U.S. borders? Most experts told us that if this proposal became law or was implemented through executive order, it likely would be challenged in court. International law says that a signatory to the United Nations Refugee Convention/Protocol (Article 33) cannot return a refugee to a country where he or she faces persecution on account of race, religion, nationality, membership in a particular social group or political opinion, said Deborah Anker, a clinical professor of law, founder and director of the Harvard Immigration and Refugee Clinical Program at Harvard Law School. "If the United States turns away people at the border, or from within the United States, it is violating the Convention/Protocol," Anker said.